Group of Five (5) Gun Books. 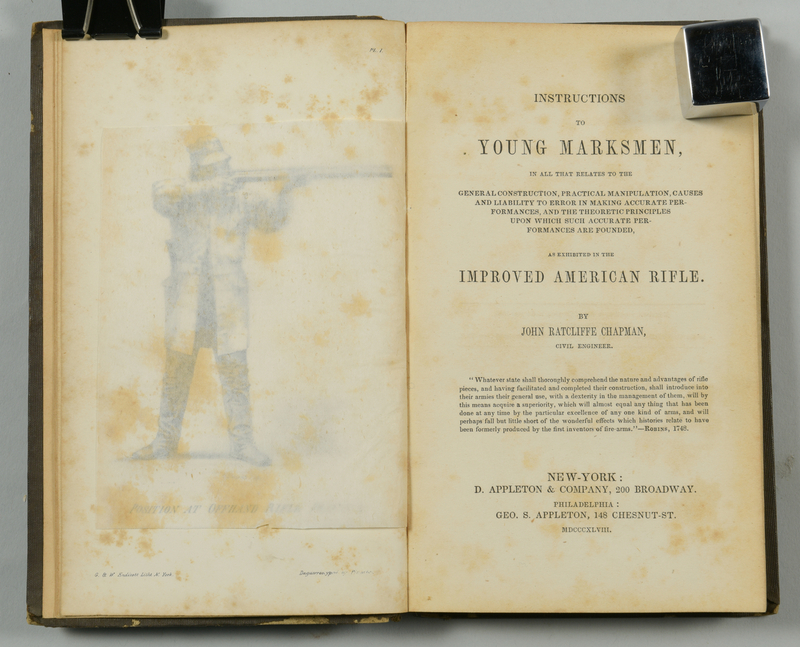 1st item: "INSTRUCTIONS TO YOUNG MARKSMEN…AS EXHIBITED IN THE IMPROVED AMERICAN RIFLE." by John Ratcliffe CHAPMAN, published by D. Appleton & Company, 1st edition, 160 pages with illustrations, 1848. Brown cloth and cardboard bound book with a gilt gold pictorial stamping of a man holding a rifle on the front cover. Lithographic print of same image titled "POSITION OF OFFHAND RIFLE PRACTICE." drawn by Charles R. Parsons, lithographed by George and William Endicott, daguerreotyped by Pianke. Ex libris plate inscribed "Jon De Tow", back of front cover. Also includes 24 page catalogue of works by Appleton & Company, back of book. 7-5/8" H x 4-7/8" W x 3/4" D. Mid 19th century. 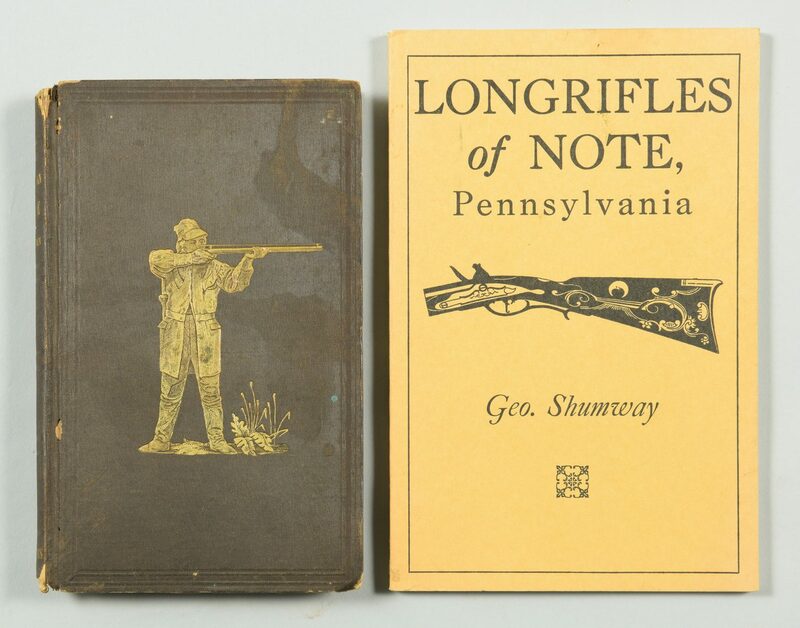 2nd item: "LONGRIFLES OF NOTE, Pennsylvania" written and published by George SHUMWAY, 74 pages with illustrations, 1968. Mustard yellow cardstock bound book. Ex libris plate printed "HAL R. SWANN, JR.", back of front cover. 8-1/2" H x 5-1/2" W x 1/8" D. Mid 20th century. 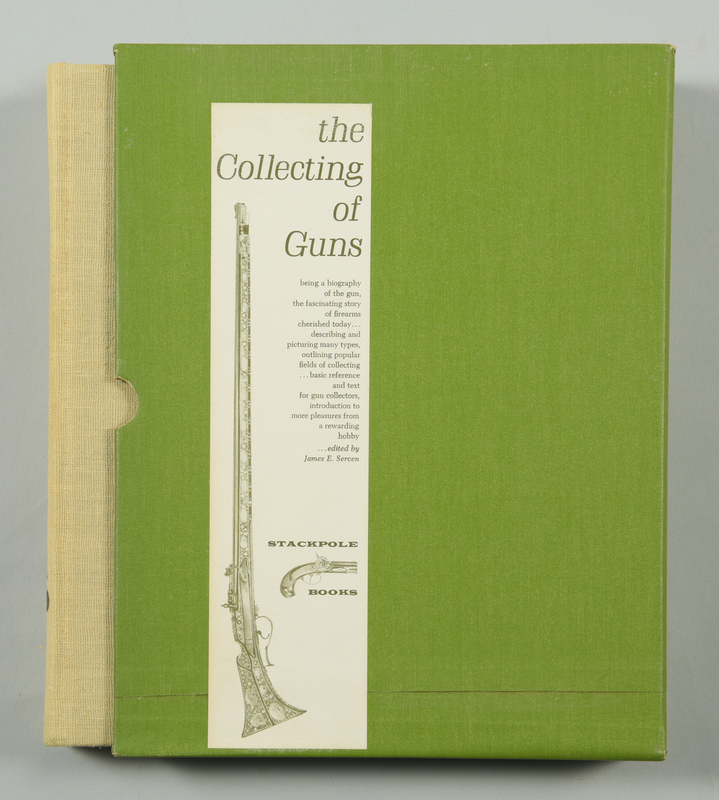 3rd item: "THE COLLECTING OF GUNS" edited by James E. SERVEN, published by The Stackpole Company, 272 pages with illustrations, 1964. Beige linen and cardboard bound book with green cloth and cardboard book sleeve with two white title stickers. 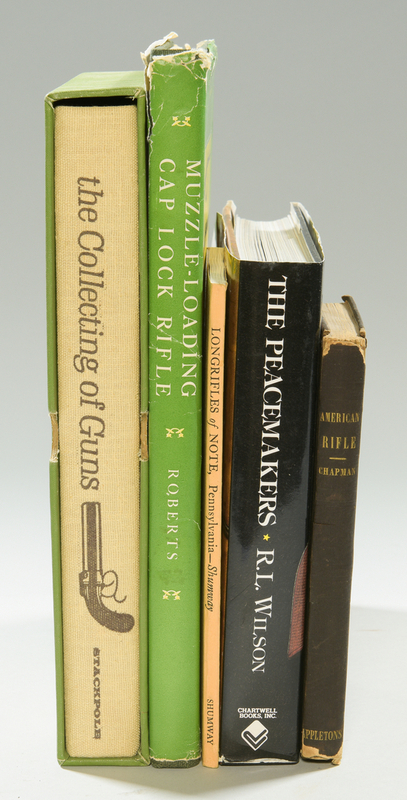 Book – 11-1/4" H x 8-3/4" W x 1-3/8" D. Overall – 11-5/8" H x 9-1/8" W x 1-3/4" D. Mid 20th century. 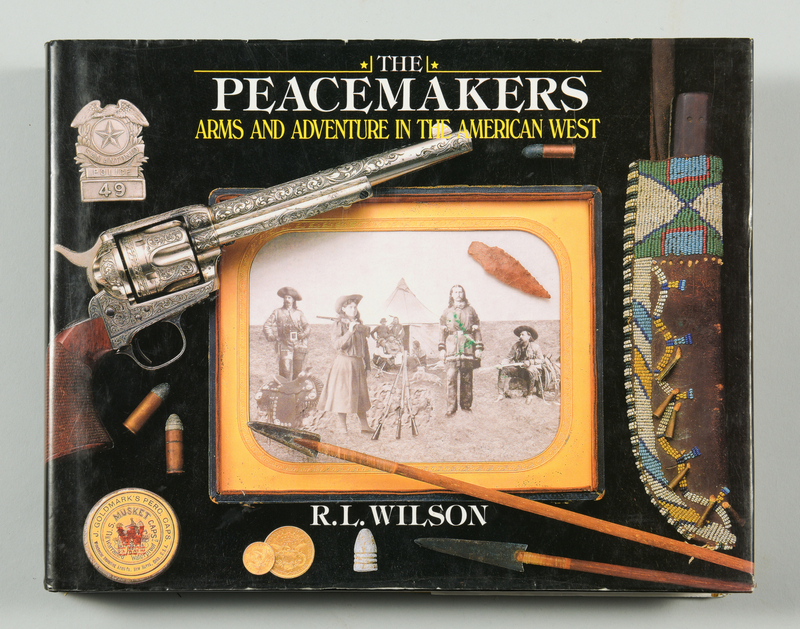 4th item: "THE PEACEMAKERS ARMS AND ADVENTURE IN THE AMERICAN WEST" by R.L. WILSON, published by CHARTWELL BOOKS, 392 pages with illustrations, 2004. Glossy cardboard bound book with glossy paper dust jacket, same image on both. 8-7/8" H x 11-1/4" W x 1-1/2" D. Early 21st century. 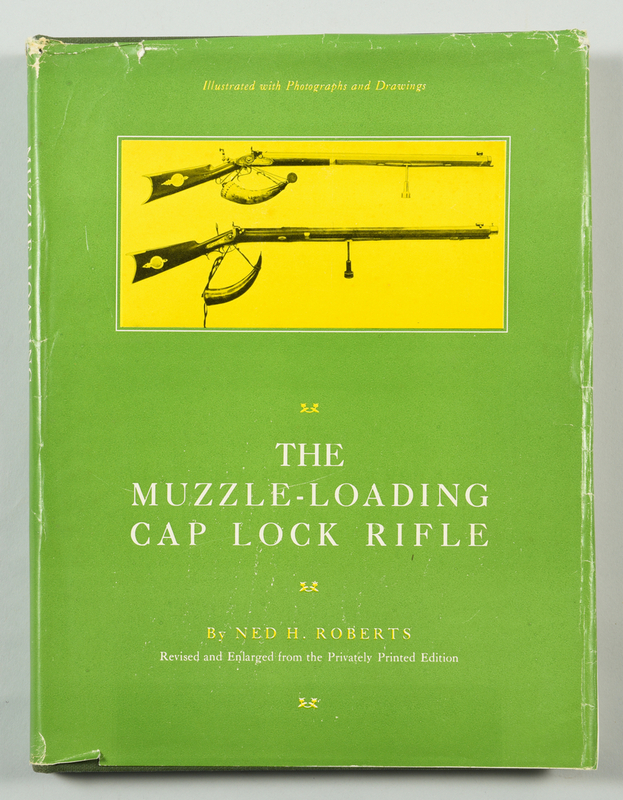 5th item: "THE MUZZLE-LOADING CAP LOCK RIFLE" by Ned. H. ROBERTS, published by The Stackpole Company, 308 pages with illustrations, 1952. 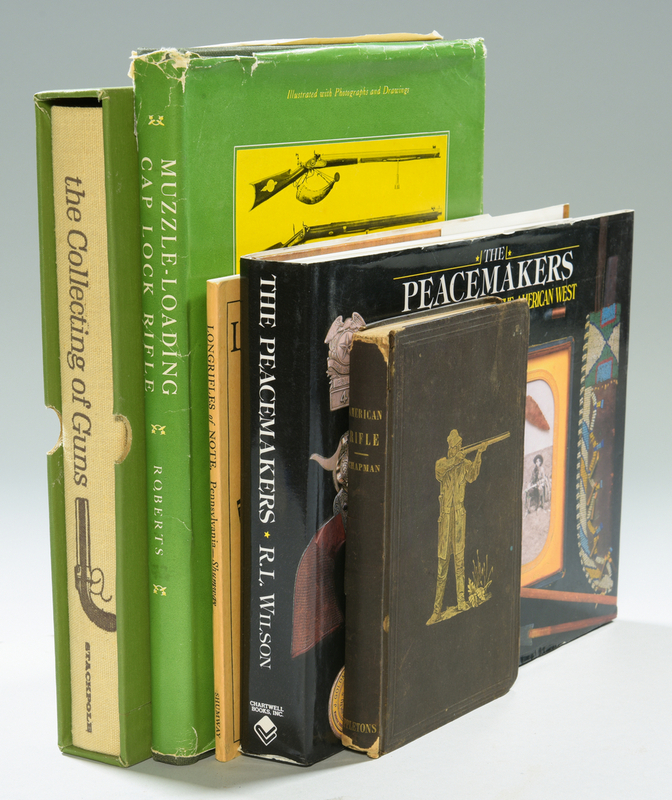 Green cloth and cardboard bound book with green, yellow, and white dust jacket. 12-1/4" H x 9-3/8" W x 1" D. Mid 20th century. Provenance: the estate of Capt. L. Bush Cole, Nashville, Tennessee (formerly of Texas). CONDITION: 1st item: Cover slightly worn, 1/8" green paint spot, right of stamp, water damage, top right. Cloth worn from spine, top, bottom, 2-1/2" sections, top and middle bottom, cloth peeling from spine, 1-3/4" section, middle. Foxing spots on first and last sections of pages. 2nd item: Black scuff marks, top section of front cover. 3rd item: Overall excellent condition. One of two title stickers on book cover damaged and has toning issues, top left corner. 4th item: Book in excellent condition. Dust jacket damaged along edges of paper. 5th item: Foxing spots on first and back few pages. Dust jacket worn around edges, plastic wrap taped to inside of dust jacket with yellowed scotch tape, foxing spots inside of dust jacket.